Transform the ordinary into the unforgettable with a Reflections Bay or Bow window. 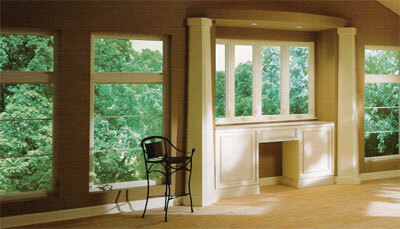 Constructed from three windows mulled together, Bay windows provide a warm, inviting appeal to any room. 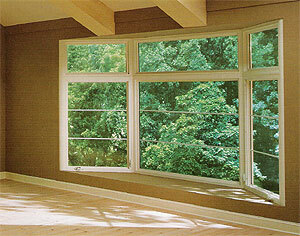 Created by mulling windows in either a 3-, 4- or 5-lite design, Bow windows create a dramatic, circular effect. Whether you choose a large Bow window to highlight a dramatic living room, or a small Bay window in a cozy kitchen, once you’ve lived with a Reflections Bay or Bow, you’ll wonder how you ever lived without it. Like a strong current masked along the confines of seemingly gentle river, one of the most beautiful things about Reflections Bay and Bow windows is their underlying structural strength and integrity . Well-planned designs and attention to detail ensure every Reflections Bay and Bow combines unmatched beauty with uncompromising performance. All Reflections Bay and Bow windows feature the same integral features found on the 5500 design, as well as many unique characteristics to further amplify their performance. The contoured bull-nose trim located at the head and seat board provides a smooth exterior and is constructed from premium extruded vinyl to guard against conduction. Its sloped interior dam fits tightly against the window, forcing moisture away from the frame and sash and providing a tight barrier against water penetration. Head and seat boards are available in I-1/4” thick oak or birch veneer, and can be stained or painted to match the interior of your home. Extra pieces of the matching wood grain veneer are provided to cover interior jamb boards for a beautiful, streamlined finish. Attractive, color-matched wooden knee braces provided added support beneath the seat board on the exterior of the home. The knee braces feature a streamlined design to blend in easily with the window’s overall construction. 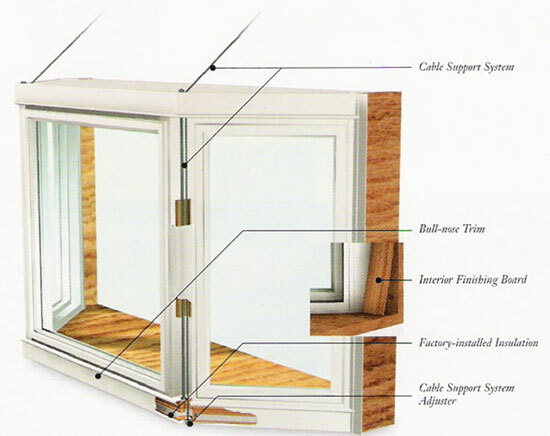 A strong, cable support installation and structure integrity for the life of the window. Secured to the bottom of the seat board’s exterior, these durable steel cables travel through mullions inside the window. Once attached to the home’s exterior, hidden within the window’s roofing system, they anchor the window into a secure formation and allow for convenient leveling adjustments at the time of installation. All seat boards are insulated with I-1/2” thick insulation to provide greater thermal efficiencies. The additional factory-installed foam barrier serves as an added deterrent against conduction. These windows can be ordered to meet the new Stimulus Package requirements and will qualify for the 30% federal tax credit! !